Just a few short days after Bonnie Belle was owner-surrendered to me, I received a phone call from a young family who had to surrender their 2 Year-old Male, Ozzie. They were in the process of a move, and had a new baby on the way. Unfortunately, they could not afford the monthly pet deposits and had to surrender not only their Border Collie, but the Jack Russell Terrier as well. I had no idea that Ozzie would fit in so well, but his behavior was almost exactly like our Reckless, who passed away a few months prior. 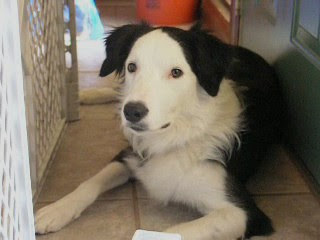 Ozzie came to us on June 18th, 2009. Much to my surprise, he is the most well-balanced dog I have ever known, and he teaches my foster dogs whatever is necessary for them to become well-balanced dogs. Dogs that come to me that are dog-aggressive get over it with Ozzie. Dogs that are shy, get over it with Ozzie. The list goes on and on, but I have come to realize that it is true, you can only teach a dog so much, whereas having a well-balanced dog interact with the troubled dog makes a huge difference. I call Ozzie my Goodwill Ambassador!